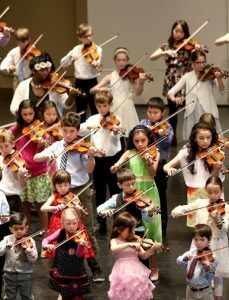 The String Academy of Wisconsin is a thriving music school, providing the highest quality training for young violinists and violists ranging in age 4 to 18. String Academy students, under careful guidance from faculty and parents, engage in a challenging curriculum that includes two 17 week semesters of individual and group instruction, daily home practice, and frequent performances (over 50 per year), master classes, classes in music theory and aural training. Depending upon the level of proficiency, (ranging from beginners to high levels of artistry), individual lessons are 30, 45, 60 or 90 minutes in length, and the weekly group lesson lengths range from 60 minutes to 4 hours. Artist faculty, all professional musicians and specially trained (advanced degrees) and dedicated to working with children, guide students from the beginning stages of learning their stringed instrument through the highest levels of artistry. An important aspect of the young student’s training is the presence, support, and encouragement of a parent at individual and group lessons, in addition to the daily practice. Faculty work with parents in lessons and group classes to help them in their child’s progress and enjoyment. In lessons, careful attention and instruction is geared to having relaxed and correct playing positions, producing a beautiful tone, playing with accurate intonation, and performing with confidence and artistry. The working atmosphere centers on a non-judgmental approach in teaching and learning. Daily practice (improving with repetitions and not focusing on time) is emphasized from the very beginning. Of great importance and benefit to students is the opportunity to play solos with piano accompaniment in the weekly group lessons. These regular performance opportunities build confidence and lead students to develop a comfort level with playing for an audience. Chamber Orchestra and chamber music opportunities also are in the curriculum. Summer session activities include a six week session of individual, and group lessons, chamber music, and a special Beginners week. Festive Week of Strings is also offered in the summer − a week long chamber music /orchestra day camp for aspiring young musicians ( Suzuki Book 4 level and above).